Come explore the enchanting, lush surroundings of this beautifully landscaped complex, Kihei Resort! The complex radiates a Zen yet tropical feel. The greenery of this place makes it seem very private and quiet. 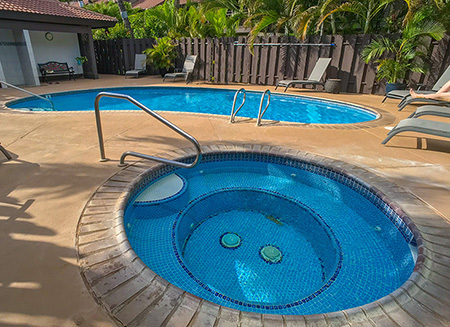 Enjoy the tranquility, the spectacular grounds and listen to the birds while sitting on your private lanai or at the pool, in the hot tub or while you are preparing your meals on the barbecue area. This location is perfect as it is steps away from gorgeous Kihei beaches, and minutes away from grocery stores and restaurants in Kihei town.